I was born in Kenya where I got started in Ceramics while attending the Greenacres School. After said exposure, I knew right then and there, that my life from that point onwards was going to be filled with clay, kilns, experiments, meeting/sharing ideas with fellow artists, and so forth. For more info on my professional background, my Curriculum Vitae is now online. In life, the path we choose to take is greatly influenced by those around you. In my case, I was fortunate to have been around encouraging and supportive people (artists, mentors, etc.) and organisations which allowed me to pursue my dreams as an art professional in Ceramics & Pottery. Over the years, I’ve created a wide variety of ceramics and pottery artwork that was mostly stored in printed photographs or Kodak slides from yesteryear. Hopefully, I’ll find time to scan everything so that I can share my passion with everyone on the World Wide Web. Join me for Adult or Childrens pottery lessons! Don’t forget to leave a comment, feedback or a review in my Guest Book! Instead of reinventing the wheel in regards to highlighting my expertise in this remakable field, I will simply refer to my final academic assessment from a very inspiring person — my mentor, Ken Bright, at Goldsmiths’ College. 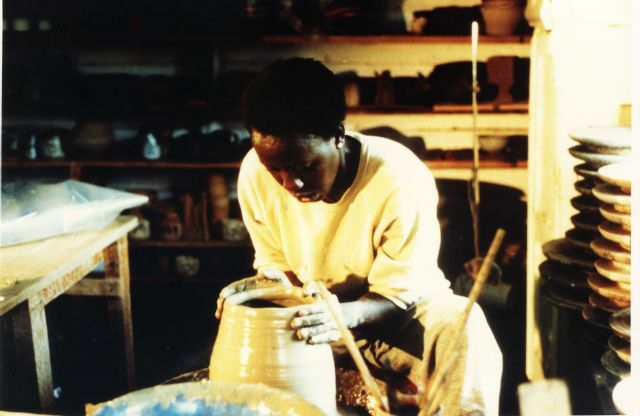 During the academic year 1988-1990 Waithira Chege undertook a programme of study leading to the award of the Goldsmiths’ Diploma in Ceramics, and which she successfully completed in July 1990. Throughout the course Waithira was exceptionally industrious and proved to be a most dedicated student. The most notable aspects of her studies in the period were as follows. A number of clays and allied materials from Kenya were tested and analysed by Miss Chege. At least three clays proved successful manufacturing and glaze-making clays under appropriate blending and firing controls. Progress was made on the formulation of glazes at stoneware temperatures. Waithira was responsible for the original calculations and developmental modifications to a number of glazes which she subsequently is using. Kenyan clays were used in some of these glazes. The design and making of an extended range of domestic wares was undertaken by Waithira and successfully exhibited as her main project for her diploma. Waithira quite thoroughly researched gas kiln designs and construction methods. She is presently having two kilns constructed in her workshop which directly relate to the research previously mentioned. Having very demanding requirements for her years study, Waithira managed to make a number of significant visits to professional practitioners and study sources. (i) a 3 day study/drawing course at the Victoria & Albert Museum. (ii) a 1 day seminar on African pottery at the Horniman Museum. (iii) visits to Ray Finch – Winchcombe Pottery. Abbersywyth Summer School – Mike Casson. Robin Welch Pottery – East Anglia. Toff Milway – Researcher on traditional Kenyan Pottery. It should be noted that Mr. Millway (Researcher) was interested in Waithira Chege assisting him with continued studies into Northern Kenyan traditional potteries. Waithira Chege demonstrated technical and aesthetic advances in her pottery making of a marked degree. Her commitment, enthusiasm and application to her subject has provided a sound and very extensive basis on which she can pursue her own practice in making potts and teaching ceramics in a institutional context. A most rewarding student of ceramics. I will always remember Ken Bright as a man who was extremely passionate about the Arts, and who opened a lot of doors for myself — and other artists. Sadly, he passed away in a swimming accident in July 2005. Simply put, the world has lost a great visionary and teacher of the Arts. He, truly, was a remarkable man. Hence my thoughts will always be with him, and for his family.